Do you have an altar in your home? A place where you always go to spend time with the Lord? A place in which the atmosphere is pregnant with the glory of God so that all you have to do is sit there in order to feel His presence? Making an altar in my home is one of the best things I’ve ever done to help myself increase in intimacy with God. Why has this been such a big deal to me? 1. Because God will open a portal to Heaven in a place that’s dedicated to Him. God cares about land. He cares about places. When a place is dedicated to Him, you can feel the difference. He will actually open a gateway to and from Heaven over that place, and you’ll have supernatural encounters with Him there. Genesis 28:16-17 describes one such instance, in which a wanderer named Jacob happened to stop at a place that was special to God. He had a radical dream and actually saw angels ascending and descending between Heaven and earth in that place. Then he saw God Himself, and God spoke to him about his future. I believe there is an open portal to Heaven over my altar. It may be a small one, but you would not believe how pregnant the atmosphere is there. It’s saturated with God’s glory. And whenever I sit down there, even if I’m having the worst day ever, I can feel the presence of the Lord. The Holy Spirit ministers to me there, and His presence and work are powerfully manifest. 2. Because having a dedicated altar in a quiet place feeds your spirit’s need for separation and solitude. Everybody needs time alone with God. It doesn’t matter if you’re an introvert or an extrovert. If you’re alive and breathing, you need time alone with God! Jesus was huge into taking time alone with God. You can see this especially if you read through the Gospel of Mark. It seems like almost every few verses in that book, you read something about Jesus taking the disciples and going away into a deserted place; Jesus going up to a mountain alone to pray; Jesus spending all night alone in prayer to God. Over and over. After ministry, after a big day, after a lot of excitement… off goes Jesus to spend time alone with God. Well, if JESUS needed time alone with God in a deserted place, I think you and I do too, don’t you? We were made to commune with God. Each of us ARE a God-shaped hole, and only God can fill our innermost needs. We can’t fill our deepest needs with fun, TV, emotion, physical pleasure, relationships, or anything else. Only God can satisfy. Making an altar in your home gives you a dedicated place to separate from the chaos of life and commune facedown with God. 3. Because having an altar in your home helps you develop the daily discipline of spending time with God. Having a place that is yours; that you love; that is beautiful to you; that is cozy and personal… makes you want to spend time in it! And when you are in the habit of spending time in that place, and knowing that that place is the spot you spend time with God, helps you spend more time with God! Especially if you are a new believer, you need to make an altar in your home. Give yourself every advantage as you’re learning to know God. Train your body and mind to seek Him in your special place. 1. Pick a place that’s quiet and away from everything else. Make it a place where you’re not staring at piles of laundry or at dishes that need to be washed. Make it a place where you can hide from your kids, your spouse, your phone, your computer, or anything else that screams for attention. Believe it or not, the Holy Spirit rests on order, not on chaos. You will feel a tangible difference if you will clean your spot out. Even if you have to start with a 2-foot by 3-foot spot on the floor. If that’s all you can clean, do it anyway. Make your spot clean and orderly, no matter how tiny it is. 3. Place your Bible study materials in your altar, so you can always find them. I keep my Bible (when I’m not using it somewhere else), my journal, a few pens, a highlighter, my Strong’s Concordance, and whatever books I’m currently reading in my altar. This way, I rarely have to look for anything. It’s simple and easy. Your spirit and soul crave beauty. God made you that way. When the beauty of your special spot feeds you, you will be able to connect with God more–because beauty comes from Him. Jesus is the Author and Picture of beauty. When I lived in a different house, my altar used to be in a plain old storage room. It worked, but it sure wasn’t pretty. Even after my husband and I moved to our current home, at first my special place wasn’t beautiful at all. It was just a room with four walls and a window. However, when I added a pretty blanket, and a colorful throw, and art on the walls, I really started to enjoy my time with God more. The beauty of my surroundings made me reflect on the beauty of God. So no matter where your altar is, start adding beauty where you can. Maybe you don’t have a whole room of your own to dedicate as an altar. That’s ok. Maybe your special place is in a dry tub, locked in the bathroom by yourself. That’s ok. Get some candles and a pretty basket and place them by the tub. Hang a pretty picture beside the tub. Make it as pretty as you can. You’ll be glad you did. That’s it. That’s how to make an altar in your home. I would really encourage every person to make a special place for you and God. Make an altar in your home. It will be one of the best things you’ve ever done to increase your intimacy with God. Where can you find a spot in your home to set aside as an altar to God? Thank you for a wonderful site and blog! God is using you in a profound way! I too have an altar and it’s been so amazing to see God move in answer to prayer given at my altar. It is a spirit filled atmosphere when I give my praise, prayers and petitions there. The Lord had been leading me to consecrate a special place to pray, once I did, my worship, reading of the Word and prayer experience has not been the same. My husband and I have received many blessings and answered prayers petitioned in this place. We experience His presence in our spirit. The first day that I set up my altar I prayed and blessed it, consecrating it to the Lord. I prayed and petitioned God about a delinquent financial matter totalling $139,000.00 which had been weighing and pressing heavily on me. I contacted the company and requested to speak with the financial manager to see if I could make some arrangements for repayment aside from the credit collection agency. She was not in and I left a message for her and said that I would call the next day. Well the third day I called and asked for her and she said yes she received my message, however the financial committee met the day before and decided that because of the age of my account, they decided to write off the debt and I did not owe anything!!! They would also send the info to the collections agency to cease contact! Praise God! I know that it was because of obedience and prayer placed on my altar that this swift and complete answer came forth! I encourage everyone to set aside a special altar only onto God and He will meet you there!!! That’s pretty amazing stuff! Thanks so much for reading and for sharing! Thank you for this. It truly makes sense. All I can say is Wow! God is so amazing and He blows my mind daily. Thank you for sharing that! So today during my quite time, I felt like God said, make an altar to me in your home where my spirit can live in your home and abide with you. I thought. I must be crazy! I must be hearing from the devil. Until. I found this post. Made me feel so much better and at ease. I knew an altar was biblical, but the idea of an altar just kinda scared me a little until I read this. Thanks. I was just reading about how David created an altar to God in 2 Samuel 24 and thought, “Hmm I should make an altar in my home somewhere.. but where should I start?” This is a great blog post and I really appreciate you sharing this inciteful wisdom. I pray you continue your work as a domestic missionary, and it grows and thrives for the Lord. Peace unto you. Wow! Praise God! We have truly amazing God! Yes, God does answers Prayers, its either be Yes, for it is the perfect time!, No, for isn’t yet the time, and surely God has something better for you or Wait, for He is still preparing the best for you. Thank you Father God! This is an AWESOME TESTIMONY!! I was seeking information on building alter and came this site. I am dedicating an alter to the Lord in my home..so excited!! I watched a growing retreat center struggle with this kind of space issue. People need a place set apart for prayer. I determined to make such a prayer room in our home. The opposition to the idea was a sign to me of how important it was. Even when the room was turned into an office, a dining room, a guest room, or used for some other purpose, it remained the prayer room as well. All of our children gathered there to pray with us while they were growing up. I have that special sense of peace when I enter the room, the knowledge that God will meet me there as He has time and again. While I pray in every other room in the house and in other sacred places — memorable prayers and answers to prayer have dotted this patch of land dedicated to Christ the King — the prayer room remains a sanctuary and everyone knows God is waiting somewhere to speak to him or her because a room in our home was set aside for that primary purpose. Really great post thank you. I have a chair in our bedroom I used to use, but then it got covered in clothes, then I decided to recover it…. Eventually I got a friend to help me unpick the old cover as a template and cut out the new material. I then put it on the chair and pinned and partly tacked it… It has been in that state now over a year….. Please pray I get my ‘altar’ back! I didn’t realise how important it is and maybe the enemy’s put the brakes on! Hi Chantal! You made me laugh about the chair. Been there, done that for sure! But I’m glad you have a place for now in your garden, and I pray you’ll get your altar back real soon! Holy Spirit, help! 🙂 Thanks for reading and have a great day! I can also testify to the importance of an altar in the home. When I moved into my home the Holy Spirit kept whispering that I should set up an altar and as I dilly-dallied, I happened to go to a store to buy furniture and found 2 women talking about a family altar and I knew it was an emergency. I set it up where I felt the Holy Spirit was leading me and lo and behold I discovered something in that place of my house that saved my life. Had I not set up the altar there I would have missed it. I therefore encourage everyone to set up a space in their home for God. Wow, great testimony. I agree! Having an altar makes all the difference in the world for me personally. And how cool is that that you just happened to hear someone talking about it at the store! Sounds like a God-appointment for sure. 🙂 Thank you for reading! Have a wonderful day! I’m so loving this. I need that sheep- skin rug, I’m also one nice elaborate elegant things! I’m His princess, why not. Learning from the Best. Making my altar as we speak. I started family altar(home prayer)tomorrow, so i need your prayer guys.blessed. May Papa bless you as you draw aside to seek His face in prayer, friend. Thank you for reading! This is a great post because it’s something that is overlooked when teaching others about a relationship with Christ. While I realize we can pray anywhere, amazing things happen when we make time, and space to spend with Him. This needs to be taught more. It’s important! Good stuff. Bill, I completely agree… A dedicated time and space for the Lord is so essential. It shows honor for Him, and keeping that space set aside and going there to pray obeys Jesus’ command to go into your closet and shut your door when you pray. I can tell a huge difference between when I pray in my altar vs when I pray in my bedroom or another room, even. God honors places… Land is important to God. This is what I have been looking for. I’m starting an Altar in my house straight, now that I know what to do. Amen. And you too. I believe you will really be able to notice the difference when you get alone with God in that altar! It will be your secret place (Psalm 91:1). May God anoint and richly bless you with His manifest Presence as you seek Him first. I too have zero space and loud kids but I’m going to clean out my closet and set it up with lights, soft pillows and decorate that little space up! I live in a 2 bedroom apartment in new York city with a disabled husband and a teenager, they each hog the bedrooms I don’t know where to set up an altar. Great post though. The Lord will show you what to do, Ann. Maybe He has a creative solution in mind! Even a nearby park or church could be an option. I know I’ve found solace many a time in a chapel with open doors. He will show you, Evangeline! It might just be a tiny spot to sit down, but as long as that’s where you meet with Him–that’s all that matters! I would like to express my gratitude about your blog in making an altar for God.. I grow up in a christian home and attended christian churches growing up, but never had a proper connection with God in my house nor in any other place except at church. I recently found that perfect section of my dwelling to connect with God and begin to continue seek Him. 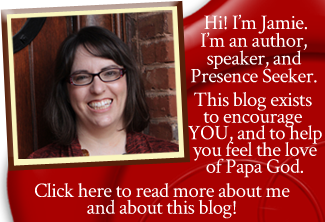 I am moved and encouraged by your blog to continue seek Him everyday. Thank you and may our Father continue to use you for His glory.. Take care.. Jonathan. Brother Jonathan, I’m so glad to hear you’ve made an altar to the Lord and that you are motivated to offer yourself upon it to Him! May you increase in intimacy with our Father God, Jesus, and the Holy Spirit every day as you seek Him. In Jesus’ name. Wow great teaching sis. Thanks for sharing important information on building an altar before the Lord. The confortable place to spend time with our wonderful Lord and feel the tangible present of the Holy Spirit. Thank you so much and may the Lors bless your ministry abundantly. Hi Dolly. Thank you so much for reading, and for your encouragement! I pray the Lord would meet you in a special way in your special place, this day and every day to come. Am truly blessed by this post. I will extract a few info and share with my friends on Facebook. I hear heaven yearning for more fellowship, the Holy Spirit calling us deeper in relationship with Him, revealing Himself to us as a personality with emotions. I stay in Africa and life here is very noisy & extremely difficult to have any consistency at all except one can do your quiet time in the midnight, but my testimony is that i noticed when i decided to go closer to God He started revealing Himself to me in a closer dimension. I am more conscious now of the Holy Spirit than ever before. I will recommend everyone read “Good Morning Holy Spirit” , by Benny Hinn. Thank you all. Thank you for sharing, brother. I’m so glad the post blessed you. I really enjoyed Pastor Benny’s book as well. May God bless you as you continue to seek Him. Hi Jamie – After watching the movie “War Room” I was motivated to find such a place of solitude in my place. Just now before I read your very encouraging blog I read how Abram built altars to the Lord as he journeyed and Lot didn’t – they were both righteous men. Then I read your blog and I know I have to do it. Thank you for sharing how to do it and how to beautify it. I agree – Jesus, Creator of this beautiful universe is beautiful, loves everything He created and therefore it’s important to beautify your surroundings in this special place where we meet with God. Thanks for the inspiration and bless you! Wao, God is good. While reading your post on building an altar, my mind went back to the early days when I moved to my new apartment. I used to have a chair in my bedroom which I use for my quiet time with only my bible always on the handle. But as time went by that place became a place where i fold my bedspreads and keep after washing. What I do now is to go to the church, kneel or sit in front of the Altar and spend good time with God. Notwithstanding, my earnest prayer is to have back a particular place as an altar in my home so that my kids would also grow up with such lifestyle. God bless you Jamie and use us all as His instruments where ever we find ourselves. thank you so much for this post, I have always wanted to know what is the meaning of building an altar in your home and how to build altar. Going through this post have given me an insight on what to do and how to go about making my own altar. thank you and God bless you. So glad it blessed you, friend. Thank you for reading. This is a confirmation of what has been missing in our home. I was just talking to my sister in law about this today. I am dedicating n setting an altar for my God as He Has been faithful to my family through thick n thin. Thank u so much for your wonderful n insightful ideas. May God meet all your needs. thank you. l have been searching for how to be close to God. l accidentally saw how to make an alter in your home when I searched the net. l will follow the instruction on how to build an alter in my home. will it be proper in my toilet? Hi Joyce, you can make an altar wherever the Holy Spirit leads you to do so. It’s completely between you and Him. I would just encourage you to pray about it and ask Him where He would like to spend time with you! Jamie thank u for your blog. My heart has been so burdend about building an altar to God in my home The lord led me into starting my set up today and I followed through . I did the set up , and felt good , but then I didn’t know if I needed anything else done to really make my altar a holy place for gods presence to be felt. So I decided to google about building an altar and God led me here. I just want to testify to say that god is real and he definitely wants us to have a place set aside for him because everything I needed to get me started Came to me with ease. Do I need to consecrate, to feel gods presence ? If so how is it done. Hi there. I would anoint your whole house with oil, and then anoint your altar too. Just me, personally. But you can ask the Lord, and He will show you what He wants you to do! Thank God for directing me to you this morning . Thank you for directing my thoughts aright. Hi sweety.That was pretty inspiring.I just need to know how to consecrate it.will be grateful fordirectives.God bless u. Praise the Lord. In this last days we need God to speak to us. A quite place with Him is wonderful. Thats where God can mold us for usage in His Kingdom. Be blessed and keep on seeking His face. I have my Altar but its on my Computer stand.My bibles,stickers,booklets,prayer candles and pens are alwez there.The problem for not heving a quet space for the Altar is because wi jus renting in this single small room with my wife and 2 year old son.My question is,is the Holy Spirit dwelling on my Altar ez well and actually how do i prove if it is? He’s everywhere, friend. Psalm 139 says so. He will definitely meet you where you are. This morning I am sitting in the dark, on my husbands recliner in the living room at 4:49am. This is the best area (in the dark while my entire family sleeps) for me to experience God. But in my quiet time, my Spirit moved me to build an alter and I didn’t know how so I researched it and came across several postings on it. I enjoyed yours the most. I too have a chair in my bedroom that I have long before designated as my prayer space and that has been overcomes by clothes and clutter. And you are right, my Spirit has been unsettled since and for awhile. Thank you for your inspirational post…I am excited to begin clearing that space for God this weekend! If I could call in sick today I would! That’s how excited I am. Please pray that I will reclaim that space and this household for Christ. I want to have the supernatural ability to change lives not only in my home but in my neighborhood, my church and my community! Thank you! I did pray for you, Kathy. I would love to hear how it goes as you work to cleanse your house and make your altar to the Lord! Have a wonderful day! It’s nice to meet you and thanks so much for reading my blog! It’s being wonderful and blessing reading.It so encouraging, being having this need in my spirit to have an altar in my home but didn’t know how .This have encouraged me and given me understanding and the need to have a family alter.Thanks for your inspiration God bless you. So glad this post encouraged you, Diana. I pray your altar would be anointed! And, thank you for reading! Many blessings to you today in Jesus’ name. I was having a little argument with someone who said the altar is completely outdated, no longer necessary in the new testament. I didnt know much about an altar but i knew it couldnt have been totally out of the picture since it was mentioned in the book of Revelation, so i went searching on net and i found this page. Not only have you cleared the air but you have also made me realize its importance. Im definately gonna consider making one.Thank you so much. Thanks for this wonderful article. 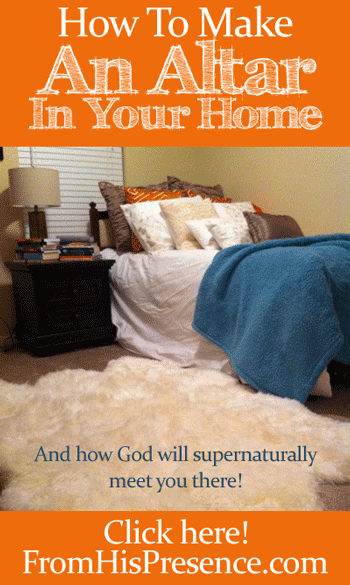 I had always wanted to have a place for God in our home but never knew how to go about it. My brother shared with us about altars and their importance in our lives, so I sought out to get guidelines on how it should be done. We have limited space but from your guidelines I have been blessed with a pretty good idea on where I can set it up. Am looking forward to God meeting me and my family in the space am going to dedicate to Him. God bless you for opening our eyes to what seemed a mystery to many me inclusive. Be blessed! Thankyou even before I read your blog the first thing I did was clear it out and clean it,so that was very good information. I also like the beautification part , that helps make it personal.Placing your Bible and study material will also have you visit your alter more frequently , all of your advice is awesome , GOD BLESS !!!! Loved the insight. God put in my spirit this morning about an alter. So thank you for sharing your experience. My husband and I live on a ranch in southern New Mexico. This ranch is in a valley away in the middle of nowhere. We have always found special time with the Lord in the outdoors​. We have always hiked, so we find a spot where we feel the Lord’s presence the most. After reading this, I feel a need to locate a special spot close by to dedicate to the Lord. We have been blessed with wonderful mountain views, so this spot could be virtually anywhere in this area. I want to build a bench and dedicate it to Him. Love the article. Blessings are sent your way! Thank you so much Jamie, your such a blessing in my life. Thanks for sharing this blog. It came at the right time for me. I been praying for a miracle for my job. I work in a tower at a heliport. Im in my tower by myself. I arrive at work at 4:30 in the am so I can spend quiet time with God before my day starts. I am so sad that they want to close our base down and move us to a new location where I wont be alone and not so peaceful. This is more than my place of work. This is my place where I pray, worship and seek God. It’s beautiful here we are surrounded by a lake. It’s so peaceful. I been praying for God to please send us a miracle because right now the situation seems hopeless. The CEO and his advisors are adamant about closing down our base. This blog helped me to realize how important this place is to me and that I need to create a spot at my house also. Thank You so much. God Bless You and Your beautiful family abundantly. Recently we moved from a house we were renting in. Never was rent late until the last two years of struggle I had a place our bedroom where I could go to now we just moved on December 24th and 25 because we could no longer pay the rent and got behind. Now were living in an Rv the 4 of us. and its crowded I’m having a hard time trying to find that place of refuge, my quiet time that altar where I could go and talk with Lord. I find the only place is in my car. Does it have to be in your home? Elsa, yes I believe it can. Any quite place where you can full focus on communing with God. I live in a very small apartment with husband and 2 kids. Space is a big issue, but either way I’m going to clean out my daughters closet (which to tell you the truth, is probably as big if not smaller then a back set of a car) set it up with lights, candles and a soft place to sit! I have lived out of a car before and I hear and feel for your struggle. I ask our mighty Father to lift you up and provide for you and your family a beautiful home and to bless and strengthen you in Jesus’s holy name amen. May you hear his voice answer his call and be obedient to him always. Am so grateful about this blog. i know it was not accidental because our God is not of such. Apparently when I built my retirement house, I thought I should dedicate it in a special way to God, but did not know how. Led by the holy spirit I apportioned my bedroom, and am grateful with the space, that came out. This blog has helped with the beautification part, all of your advice is awesome , GOD BLESS as He continues to use you in a mighty way. This is great and wonderful to have a secret place for my God.I know I have Him in my heart but I must have him in the physical by creating a meeting place with my maker.To take a communion,a conversation,an audience and a sitting with the Almighty God. Thanks for the confirmation,I pray in my bedroom every morning,I have also set up an alter in the garden,I also work from home, staff members sleeps on my lounger ,I found that I have lost my altar,today I am going to re-set it up,Yes It is amazing how God meets me at the altar. My grand kids call it my secret place. Thanks for the awesome confirmation. Thanks and God bless am inspired I have being looking forward to know what it takes to maintain a personal altar now I know better. thanks for sharing. i live in africa, zimbabwe and enjoyed reading your blog about altars. i personnally do have one in my bedroom. Each time iam inneed, i take my sacrifice to my altar kneel down and ask God for that particular blessing. I have realised that God responds to altar sacrifices with speed. i am self employed, but i tell you i have never lacked in my life eversince i learnt about home altars and sacrifices. I am in the process of setting up an alter and was wondering what your sacrifice is. I now spend time with god at 5 am in my living room but have recently felt the need to move it outside in a shed I cleaned out for this purpose. This will allow me private time in the evening as well. I love the Comments.I see Miracles in alot of the situations comments that only God The lord can do.Amazing and a blesssing too. I want to know how to make an Alter to the Lord God to set in my home now . I want to be blessed and my family to be blessed too. And for my finaces money prosperity blessings too. i need help fast! Praise the Lord for this beautiful article. I too have been led to do this for years but keep praying here and there around my apartment. I am procrastinating no more. This confirmed my feelings and it must get done. Thank you so much! God bless you and all those who posted comments. We are all definitely being called to do this for a reason. It’s wrong to ask God to bring you a certain person. That is witchcraft (see this article for more about that). It is not wrong, however, to set aside an altar area where you go to spend time with God and seek Him and His will, which is what this article is all about. I encourage everyone to do that. Hope this helps. I have found in my dealing with God the Father, Jesus Christ, his son whom he raised from the dead for our sins, and the Holy Spirit, is that God delights not in altars built with human hands, but instead in the altar set firmly in our heart, where the fires of the spirit and faith in Christ burn. But in faith, you could erect a stone to the Lord and it would be an altar to him, but that was the case in the old testament, in the new testament Christ is our altar. Every prayer in faith, and truth in Jesus Christ name is as a holy Altar to GOD though the workings of the Holy Spirit who resides in us that believe….